Above: Vera Rubin at Vassar College Observatory, Photo courtesy Vassar CollegeDiversity of opinion enhances the success of scientific teams, and it is essential that healthy, thriving, vibrant science broadly represents the members of the society it seeks to serve. To advance this goal, UC Santa Cruz Astronomy has established a new kind of endowed faculty chair—one created deliberately to advance the cause of diversity, equity, and inclusive excellence in astronomy. The new chair is named after one of the world’s most distinguished astronomers and champions of inclusivity in science: Vera Rubin. Rubin (1928–2016) transformed modern astrophysics by showing that galaxies and stars are immersed in the gravitational grip of vast clouds of dark matter. In science and in life, Rubin was a guiding light for younger women, and for dozens of astronomers from varied backgrounds. Our six active women professors are the largest tenured female cohort in the nation, led by top scientists such as Sandra Faber, honored for discoveries in dark matter and galaxy formation, and by UC Observatories director Claire Max, renowned for her invention and use of adaptive optics. Two new young women have just joined: exoplanet theorist Ruth Murray-Clay and Packard Fellow Alexie Leauthaud, leader in mapping dark matter. We are proud to be home to eminent Latinx astronomer Enrico Ramirez-Ruiz, who studies fundamental questions in highenergy astrophysics. Read more about Ramirez-Ruiz. Women have composed half of UC Santa Cruz astronomy Ph.D. students for more than a decade, and 30 percent of current grad students come from underrepresented backgrounds. UC Santa Cruz graduates receive more coveted National Science Foundation fellowships than any other astronomy program in the nation. 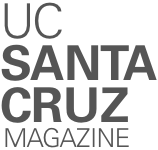 Sweeten recruitment offers, enabling UC Santa Cruz to compete successfully for the very best graduate students and postdocs from underrepresented groups. Support young scientists who have disabilities or special needs. Launch young scientists into the world to collaborate and to promote their work. These activities are of special importance to the careers of young astronomers from nontraditional backgrounds. Among the women astronomers Rubin influenced is Sandra Faber, who followed in Rubin’s footsteps by winning the National Medal of Science and the Gruber Prize for Cosmology. To demonstrate their deep belief in UC Santa Cruz’s mission to foster inclusive excellence in astronomy, Faber and her husband, Andy, launched the Rubin Chair campaign with an initial commitment of $250,000. Additional gifts from private donors, including Barbara and John Crary, the Heising-Simons Foundation, and Vera Rubin’s sons, plus a match of $500,000 from the University of California Ofﬁce of the President, now round out the ﬁrst $1.5 million, formally establishing the Vera Rubin Presidential Chair. We are currently pursuing our goal to build the chair endowment to $1.75 million, increasing the support we can offer for diversity, equity, and inclusive excellence. You can contribute to a crowdfunding project for the Vera Rubin Presidential Chair at c-fund.us/hew.